Touch (Le Toucher) VI tapestry shows the lady depicting the sense of touch. This piece is based on the originals depicting the sense of the body, as well as love or desire. Here the lady is seen touching her unicorn's horn. The flag of Jean Le Viste's family is shown, as he was thought to be the commissioner of the series of the original versions of a series of 6 tapestries. A lovely mille fleur style background decorates the background. 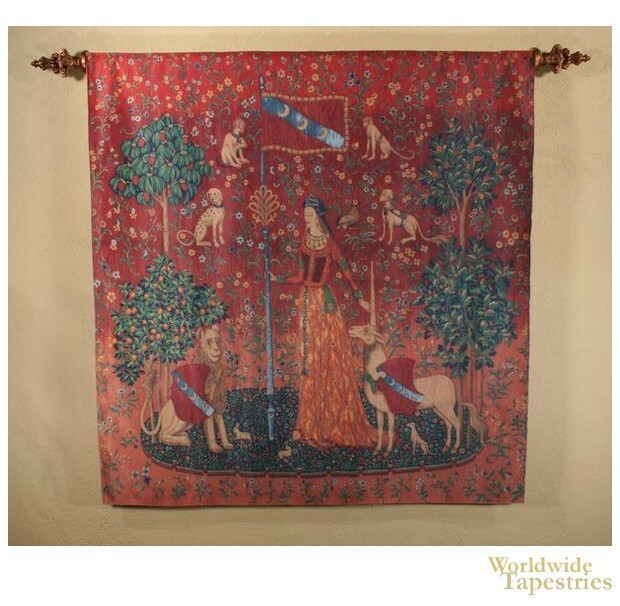 This unicorn tapestry Touch (Le Toucher) VI is backed with a lining and has a tunnel for easy hanging. Note: tapestry rod, where pictured, is not included in the price.